Jim has been an astronomy and space exploration enthusiast since early grade school. As the result of a renewed interest in astronomy in 2012, he bought his first "real" telescope and mount. He has since ventured into astrophotography, and continues to acquire equipment, skills, and knowledge to improve his capabilities. It has been a while since I have written in Jim’s AstroLog, but I have been busy. Here’s a brief run down what what I have been up to. Maybe I’ll add more to fill in the blanks as time permits. I should say that I am enjoying writing again, even after these few words. Work and a long commute consumed just about every minute that I could have otherwise had to pursue my own interests. The last two years with my former agency were among my best, but even that (not to mention myself) was getting old. So I moved on. Big news – I retired (again) at the end of April, 2017, and I have been busy getting used to that. I kinda like it. I am probably working harder that I’ve ever worked, but with the difference being that I am doing the things that I have always wanted to do, which is especially nice. I was elected to the Howard Astronomical League as secretary for the Boards’ 2015 term, and served in that capacity again for the 2016 term. I was elected president for the 2017 term, and I am now in my second term in that capacity. Big news for the club during my tenure as president is accepting a Takahashi TOA 150 and an Astro-Physics 1200GTO mount from David Illig, and embarking on a project to upgrade the club’s observatory. This equipment is installed in the observatory and is being readied for the club’s members use. I expect to write more about this. In the last few days before I was retired, the opportunity to teach and I found each other – I have taught three semesters of astronomy at Howard Community College. I had absolutely no interest in working after retirement, but this has been a dream job that I never thought that I could find. I am really enjoying this gig! The SET department and I have been discussing the addition of an honors section to the course, and I am looking forward to bringing it on line and teaching it. Definitely more to write about here. Gardening is my other hobby. I enrolled in the Montgomery County Master Gardener Program with the 2018 class of interns. Still serving as an intern for the rest of this year. With the exception of a trip to the Almost Heaven Star Party in West Virginia in September 2016, and to Kentucky/Tennessee to view the total eclipse in August 2017, I have doing very little of my own astronomy since I last wrote. I finally cleared the decks and put my own personal astronomy ahead of just about everything else. The impetus was signing up for the Almost Heaven Star Party 2018. Much to write about here, so expect another article. I have written about my bout with aperture fever on this site, and how I overcame the affliction – at least temporarily. To be fair to myself, I did a through assessment of why I bought the Televue NP101 (4″ apochromatic refractor), and I came to terms with why it is a fine instrument. I am by no means abandoning this telescope. It has a place in my collection, and it can do things that the light bucket that I am about to describe could never dream of doing. I expect to use it often for as long as I am able to engage in my hobby. Please indulge me for one more paragraph before I describe what I am buying. I have also written here about why I bought the NP101 in the first place – I am preparing to enjoy my life-long love of astronomy in my retirement. The acquisition that I am presently pursuing will add another dimension to my enjoyment of my hobby, and to my ability to share my hobby with others. And to be sure, this new instrument can do things that the NP101 can never dream of doing. There is plenty of room for both instruments in my collection. The telescope that I have ordered is a Meade LX200 12-inch f/8 Schmidt-Cassegrain reflecting telescope. Unlike others I know who have purchased Meade or Celestron Schmidt-Cassegrain reflectors, I chose to forgo the Meade fork-style mount, and chose instead the Losmandy G-11 German equatorial mount (GEM) with the Gemini II goto system. This telescope weighs 56 pounds, which exceeds the capacity of my Losmandy GM-8. I chose Losmandy mount over a Meade fork-style mount, because I intend to do astrophotography. A fork style mount is simple to use and is great for visual astronomy. It is, however, completely inadequate for astrophotography. This, and my familiarity with Losmandy made the G-11 a natural choice. And since finding objects with an instrument of this focal length (much narrower field of view) will be exceedingly more difficult than with my NP101, I ordered the Gemini II goto system to reduce the amount of time time required for find the object that I might be trying to visually observe or photograph. I expect to take delivery of the telescope and mount in six to eight weeks. I will not be sharing the news of my telescope’s arrival with my amateur astronomer friends, because they will most undoubtedly hold me accountable for the many cloudy nights that are sure to follow its arrival. Meanwhile, I must maintain my sanity by being calm and forgetting that I have a new telescope on order. This is the hottest and most humid month of the year in Maryland. Don’t be discouraged though. There will be that occasional night when the hot weather breaks, and getting reacquainted with the night sky will be an exhilarating experience. So keep your eye on the weather and take advantage of those wonderful nights. Be sure to look for the Summer Triangle, which a large triangle of bright stars that is nearly directly overhead at nightfall. These stars are Vega in the constellation Lyra, Altair in the constellation Aquila, and Deneb in the constellation Cygnus. The sky map below represents the sky as it will appear in mid-August at the end of astronomical twilight, or the arrival of complete darkness, at about 9:30pm EDT. The Scope Out monthly focus is on the constellations that are just to either side of the meridian, which is near the 18th hour (18h) of right ascension line in the August sky map below. For a primer on how to use this sky map, please read How to begin Observing the Night Sky. 1. Circumpolar Constellations: Find Usra Minor standing up on its tail, and Draco in the northern sky above Polaris. 2. Northern Constellations: Find August’s remaining northern constellations, Corona Borealis, Hercules, Lyra, Aquila, and Cygnus near the zenith. 3. Southern Constellations: The best-placed constellations in April are Ophiuchus, Serpens, Scorpius and Sagittarius. Some of these, Scorpius and Sagittarius, for example, never rise very far above the horizon because of their deep southern declination. The August Night Sky, Jim Johnson, December 14, 2014. Mercury is an evening object most of this month, appearing low on the western horizon as darkness falls. Mercury will be in conjunction with Jupiter on August 6th, and Jupiter, Mercury and the bright star Regulus can be seen within 1° of one another on August 7th. Mercury reaches this apparition’s brightest magnitude (-1) on August 21st, and its greatest eastern elongation on August 31st. Venus can be glimpsed by a determined binocular viewer early in the month. It will be very low on the horizon, and it will set just a few minutes after sunset. By mid-month, Venus will be lost in the sun’s glare, and thus a spectacular evening apparition ends. By month’s end, Venus will be on the other side of the sun as viewed from earth, and can be seen low on the eastern horizon about 30 minutes before sunrise. Jupiter also ends its evening apparition this month as it slips into the sun’s glare early in August, not to be seen again until it reappears as a morning object in September. Mars is a morning object, rising on the eastern horizon just before sunrise. Saturn, the sole bright planet that is easily visible, steals the planetary show this month. Look for it low in the southern sky near the distinct head of Scorpius. Uranus and Neptune are still morning objects that rise above the eastern horizon in the wee hours of the morning They can be seen by a determined binocular observer. These three objects will be positioned within 1° of one another providing a pretty grouping with the unaided eye, or within a telescopic field of view at low magnification. Perseid Meteor Show – August 11 to 14. The moon, a waning crescent, is well positioned to provide a dark sky for observing the Perseids this year. Summer’s heat is here and it is vacation season. Vacations are often an opportunity to get away from the city lights, so if you happen to be so lucky, be sure to take advantage of every opportunity to enjoy a much darker, and hence starrier night sky than what you might be accustomed to at home. In addition to being prepared for the cool nights that occur even during the summer, be sure to bring along something to keep the bugs away. The sky map below represents the sky as it will appear in mid-July at the end of astronomical twilight, or the arrival of complete darkness, at about 10pm EDT. The Scope Out monthly focus is on the constellations that are just to either side of the meridian, which is near the 12th hour (12h) of right ascension line in the July sky map. For a primer on how to use this sky map, please read How to begin Observing the Night Sky. 1. Circumpolar Constellations: Find Usra Minor, Ursa Major and Canes Venatici in the northern sky above Polaris. 2. Northern Constellations: Find July’s remaining northern constellations, Leo, Leo Minor, Coma Bernices, Bootes and Corona Borealis near the zenith. 3. Southern Constellations: The best-placed constellations in April are Crater, Corvus, and Virgo. Some of these, Crater and Corvus, for example, never rise very far above the horizon because of their deep southern declination. The July Night Sky, Jim Johnson, December 2014. Mercury begins the month as a morning object, just past its peak for optimal viewing. Look for it in the eastern morning sky about 75 minutes before sunrise. It quickly dives back into the sun’s glare and is lost by month’s end. Venus and Jupiter are the bright pair in the western sky just after sunset. They are just one day past a very close conjunction as the month begins, and they will travel together while remaining in relatively close proximity to one another. They will appear just a bit closer to the western horizon with the passing of each evening. Venus‘ telescopic appearance will change dramatically during the month, beginning as a rather thick crescent, and then closing the month as a fingernail crescent. Venus’ apparent disk will appear noticeably large as well as the month progresses. Mars begins to emerges as a morning object by month’s end, and will be difficult to see without binoculars. Look for it near Mercury about 45 minutes before sunrise on the eastern horizon on July 16th. Saturn is just past its optimum viewing position with respect to disk size and brightness. It is placed higher in the sky for easier viewing at nightfall. Uranus and Neptune are morning objects that rise just before dawn. The Earth reaches its farthest distance from the Sun during its annual orbit about the Solar System’s star. There are no direct observables for the casual astronomer, but if the Earth were at perihelion, or the closest distance to the Sun, on this date, northern hemisphere summers would be noticeably warmer. Look for a very pretty grouping of a fingernail crescent Moon with Venus and Jupiter low on the western horizon right after sunset. The occasion of a second full moon during a calendar month is known as a “blue moon.” July’s first full month was on July 1st. Summer arrives this month, and with it, those seemingly endless days. Summer nights, of course are exceedingly short. In fact, Civil Twilight, which is not very dark, ends at 9:50 pm and begins at 4:30 am around the Summer Solstice on June 21st. Summer nights are only about 6 1/2 hours long! Compare this to winter nights, which are about 12 1/2 hours long. If we astronomers could only have both summer weather and winter-length nights at the same time. 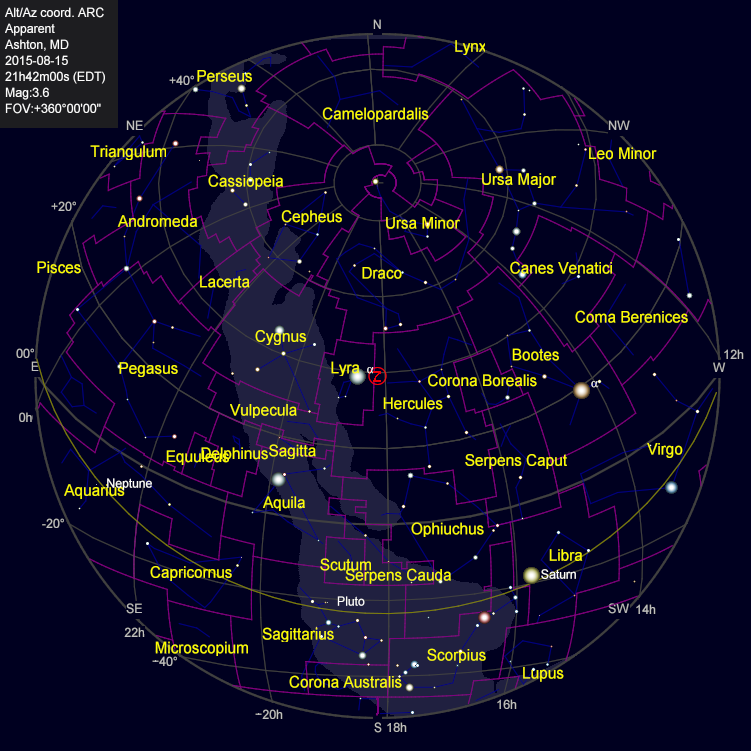 The sky map below represents the sky as it will appear in mid-June at the end of astronomical twilight, or the arrival of complete darkness, at about 10pm EDT. The Scope Out monthly focus is on the constellations that are just to either side of the meridian, which is near the 12th hour (12h) of right ascension line in the June sky map. For a primer on how to use this sky map, please read How to begin Observing the Night Sky. 2. Northern Constellations: Find June’s remaining northern constellations, Leo, Leo Minor, Coma Bernices, Bootes and Corona Borealis near the zenith. The June Sky at Nightfall, Jim Johnson, December 2014. Mercury begins a morning apparition at the beginning of the month, and it is best observed at its peak western elongation on June 24th. Look for it in the eastern morning sky about 45 minutes before sunrise. Mars in now hidden in the sun’s glare and will not be visible until it emerges as a morning object later this summer. Venus is the very bright object in the western sky after sunset. It is near its peek elongation from the Sun, and telescopically presents an appearance similar to a crescent moon. The crescent will become thinner, and the planet’s disk will appear to grow larger through the remainder of its evening apparition. Jupiter is the bright object that appears nearly overhead at nightfall. Read about its coming conjunction with Venus below. Saturn is just past opposition, and can be found above the eastern horizon at sunset. It remains showy both visually and telescopically. Uranus and Neptune are morning objects that rise just before dawn. Summer officially begins when the sun reaches its northernmost point on the celestial sphere at 12:38pm on June 21st. At local noon, when the sun reaches the meridian, it will be at its highest point in the sky for observers north of the Tropic of Cancer. The longest day of the year and the shortest night of the year occur within a few days of this date. Venus and Jupiter have been visible together in the evening sky since March, with Venus on the western horizon and Jupiter on the eastern horizon. These two planets have been slowly approaching one another these past few months, and will finally meet at month’s end. They begin the month about 20° (about a hand’s length) apart. Venus will be near Gemini’s two brightest stars, Castor and Pollux, and these three objects will appear in a nearly straight line on June 1st. Jupiter will be to their east. The moon will move through this area just after mid-month, passing Venus on the 19th, and Jupiter on the 20th. The two planets will reach conjunction on June 30th, appearing just 1/3° apart, which is the same field of view of most telescopes. May is the month that we begin to trade early sunsets for great weather. Although the weather is warmer, it takes seemingly forever for it to get dark enough to observe the night sky. The end of civil twilight is at 8:45pm and the end of astronomical twilight is at 9:20pm, and keeps getting later through the Summer Solstice in late June. Be sure to take every opportunity to just go outside and look up. Star gazing is just that easy. As interest is piqued, spend some cloudy nights reading about anything that you’ve seen night sky. 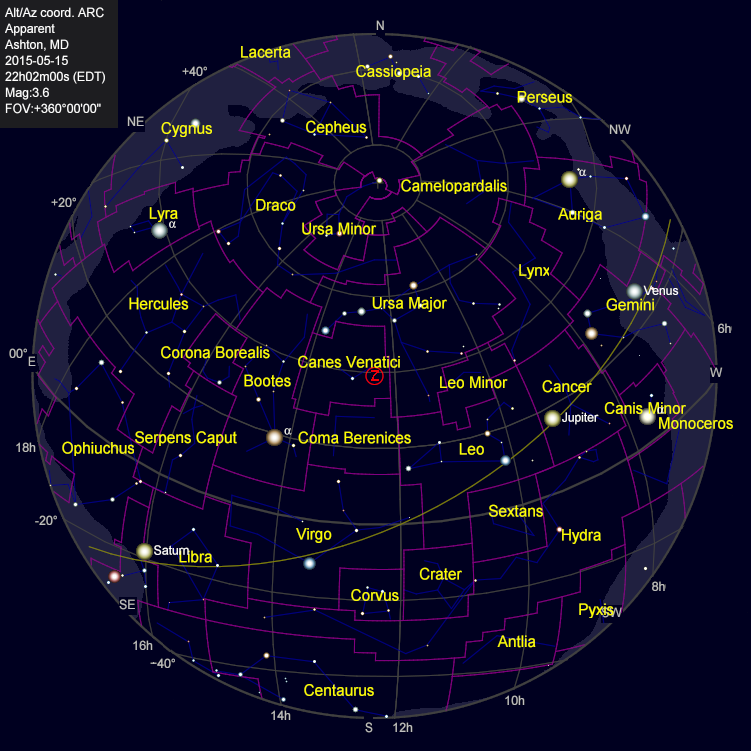 The sky map below represents the sky as it will appear in mid-May at the end of astronomical twilight, or the arrival of complete darkness, at 9:20pm EDT. The Scope Out monthly focus is on the constellations that are just to either side of the meridian, which is near the 12th hour (12h) of right ascension line in the May sky map. For a primer on how to use this sky map, please read How to begin Observing the Night Sky. 2. Northern Constellations: Find April’s remaining northern constellations, Leo, Leo Minor, Coma Bernices, Bootes and Corona Borealis near the zenith. The May Sky at Nightfall, Jim Johnson, December 2014. Mercury is in its best evening apparition of this year at the beginning of the month, peaking around May 10th, and remaining visible most of the remainder of the month. Look for it low on the western horizon about 45 minutes after sunset. The Pleiades, an easy naked eye object when it is overhead, can be seen with binoculars just to the right of Mercury. Mars will be a difficult, telescope-only object as it will soon disappear into the Sun’s glare. Look for it low on the western horizon about 45 minutes after sunset. Venus is the very bright object in the western sky after sunset. It is near its peek elongation from the Sun, and presents an appearance similar to the 1st quarter moon (half dark and half lit). Jupiter is the bright object that appears nearly overhead at nightfall. The show to watch over the next two months is Jupiter and Venus moving ever so closer to one another as they approach conjunction this summer. Take note of how many hand widths apart they are now (and write it down! ), and check again every few nights. Saturn rises in the east at sunset and is in good viewing a few hours later. Uranus and Neptune are morning objects that rise just before dawn. I was speaking with Kevin some months ago about astrophotography, and he mentioned that his camera, an Orion StarShoot Solar System IV, did not seem to be working correctly. The two problems that he mentioned were that he could not see the entirety of the moon in a single frame, and that he could not see Jupiter at all. I surmised that there was nothing wrong with the camera, and I explained that video-type planetary imagers like this had notoriously small sensors that have a very narrow field of view. Precisely aligning the telescope to cause Jupiter’s image to fall on the small sensor would therefore be difficult, and this would explain why only a small portion of the moon would be visible. He loaned me his camera for testing, and I have concluded that I was correct about the nature of his problem. I tested the camera on my C11, and obtained the results seen in the images below, which seem so confirm that the camera was working. As I began to write up the test, I learned that the camera’s sensor format was 1/3-inch. To put this fact into perspective, 6 of these sensors arrayed side by side would be required to span the entire width of the 2-inch rear aperture of the telescope. In other words, the sensor is only 16% as wide as the aperture, which explains why Kevin would not have seen Jupiter in the sensor frame unless its image was almost perfectly centered in the rear aperture. The focal length of the C11 with a 2x PowerMate is 5600mm. This results in a .14 x .14 arcsecond field of view on each of the camera’s 3.6 x 3.6 micron pixels. I set the camera to a 640 x 480 mode to improve the frame rate, thinking that I was selecting a smaller region of interest, or a subset of the sensor’s pixels at the center of the sensor. What I did not realize is that this binned the output into 2×2 arrays of pixels that would be output as a single 7.2 x 7.2 micron pixel. This had the effect of halving the resolution that the camera was capable of producing. I would like to be able to repeat this test in the 1280 x 960 mode. Before mounting the camera on the telescope, I wanted to make certain that Jupiter would be visible on the camera sensor by using eyepieces to center up Jupiter in the field of view. I started with a Panoptic 35mm, which I found very difficult to determine if Jupiter is centered. This is because this eyepiece’s exceptionally wide field of view made it impossible for me to see two opposite sides of the visible field at the same time, so centering at this stage was very much an estimation. Next, I replaced the 35mm with a 17mm Nagler, and repeated the process. It was better, but it was still somewhat difficult to determine if Jupiter was centered with this eyepiece. Next I put in a 12mm crosshair eyepiece, and was able to center up perfectly. 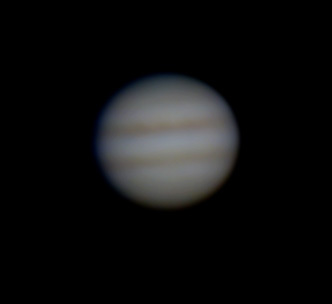 When I replaced this eyepiece with the camera, and brought it up on the laptop screen, Jupiter was centered perfectly. Finally, I put the 2x PowerMate in the optical path, and only needed to adjust slightly. On March 30, 2015, the night of the test, Jupiter’s apparent diameter was 41.6 arcseconds. I used PhotoShop to measure the diameter of the image produced by the combination of the optical configuration and the sensor. The measurement across the center of Jupiter’s white equatorial band was 142 pixels. This compared favorably to the computed prediction of 154 pixels. I attributed the difference between the computed and actual values to me being less than completely careful in taking the measurement and the limb darkening on the disk of Jupiter. Being able to predict the image size increased my confidence that Kevin’s camera is working just fine. Just a few words about the clarity of the images as I wrap this up. As I previously mentioned, the resolution of the images could have been improved by using a 1280 x 960 setting instead of 640 x 480, thus doubling the resolution. The night was fairly still and dry, so the “seeing” probably did not affect the image quality very much. Focus seems to be very difficult to achieve while watching video stream off of the sensor, so that could have been a factor affecting image clarity. I made no attempt to rule out focus as a problem by capturing several frame sets while slightly changing the focus each time. And lastly, I believe that the telescope might have some issues, which I believe can be ruled in or out by eliminating focus as an issue. For good measure, I did a couple of captures on the moon. Clarity, seems to be an issue here too. This did demonstrate that the entirety of the moon’s surface is not likely to be visible in Kevin’s telescope. 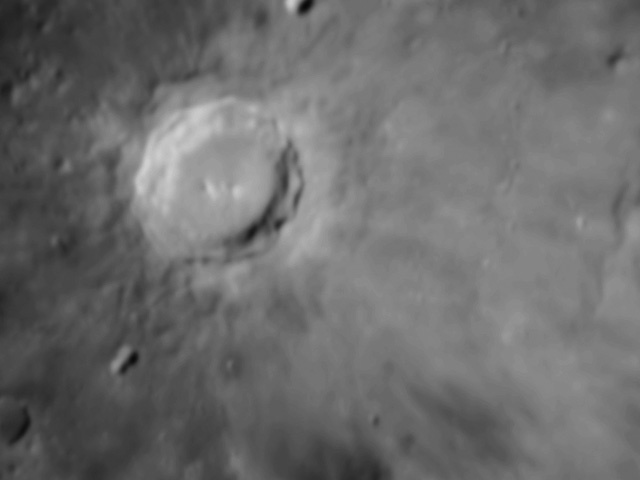 Note that in the Plato photos, adding the 2x PowerMate magnified the blurriness. All of the images that follow were lightly processed. I stacked the frames in Registax, and then I adjusted the curve and levels in PhotoShop. Jupiter by Jim Johnson on March 30, 2014 using a Celestron C11, Televue PowerMate 2x, and an Orion StarShoot Solar System IV. Plato and Environs on the Moon by Jim Johnson on March 30, 2014 using a Celestron C11 at prime focus, and an Orion StarShoot Solar System IV. 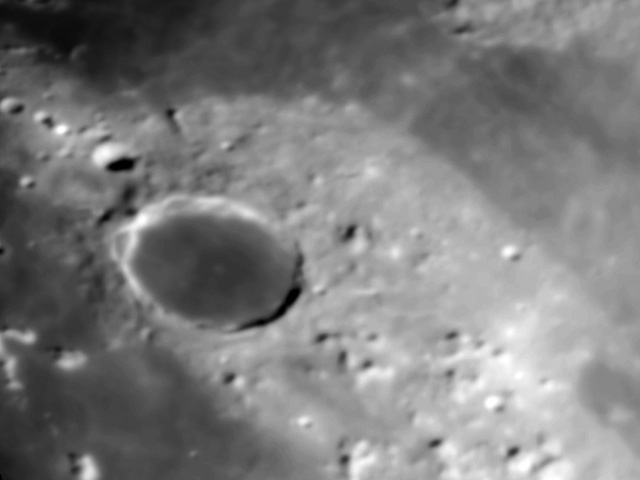 Plato and Environs on the Moon by Jim Johnson on March 30, 2014 using a Celestron C11 a PowerMate 2x, and an Orion StarShoot Solar System IV. 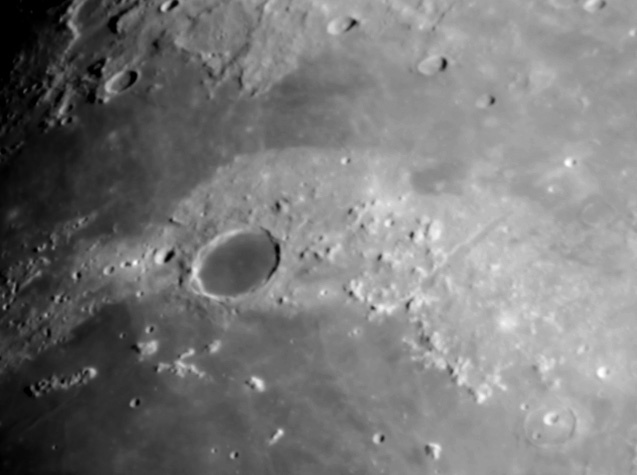 Copernicus and Environs on the Moon by Jim Johnson on March 30, 2014 using a Celestron C11 a PowerMate 2x, and an Orion StarShoot Solar System IV. © James R. Johnson, 2015. April is a great month for casual star gazing. The weather is tolerable, it still gets dark at a reasonable hour, and the evenings are relatively bug free. Be sure to take every opportunity to just go outside and look up. Star gazing is just that easy. As interest is piqued, spend some cloudy nights reading about anything that you’ve seen night sky. 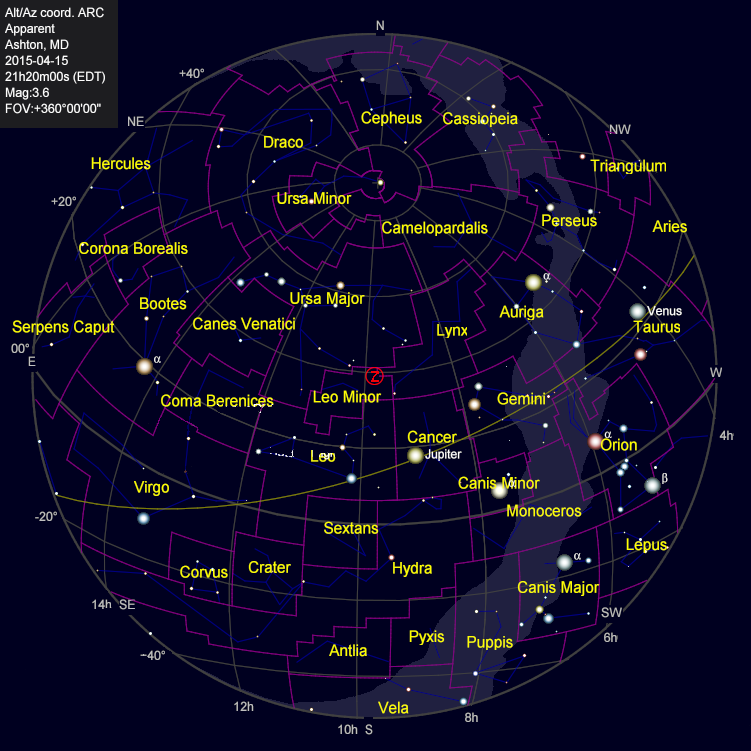 The sky map below represents the sky as it will appear in mid-April at the end of astronomical twilight, or the arrival of complete darkness, at 9:20pm EDT. The Scope Out monthly focus is on the constellations that are just to either side of the meridian, which is near the 10th hour (10h) of right ascension line in the April sky map. For a primer on how to use this sky map, please read How to begin Observing the Night Sky. 1. Circumpolar Constellations: Find Lynx, Perseus, Camelopardalis, and Ursa Major in the northern sky above Polaris. 2. Northern Constellations: Orion continues to move toward the western horizon. Although it no longer dominates the sky, it does catch they eye before setting below the western horizon about an hour or so after sunset. Find April’s remaining northern constellations, Cancer, Leo, and Leo Minor near the zenith. 3. Southern Constellations: The best-placed constellations in April are Hydra, Sextans, Pyxis and Crater. Some of these, Pyxis and Crater, for example, never rise very far above the horizon because of their deep southern declination. The April Sky at Nightfall. Jim Johnson, December 2014. Mercury begins its best evening apparition during the last week April. Look for it low on the western horizon about 45 minutes after sunset. It reaches its best viewing opportunity during the first week of May. Mercury and Mars put on a planetary show on the western horizon around April 20th, and can be seen with binoculars soon after sunset. Venus’ brightness will dominate the western sky after sunset, and will continue to appear a little higher above the horizon each evening. It will move through Taurus passing near the Pleiades and Hyades around mid-month. Jupiter is in its best nightfall view position near the meridian at sunset. Saturn continues to rise earlier each evening, appearing above the eastern horizon about two hours after sunset. Uranus is lost in the Sun’s glare and will soon reappear as a morning object. Neptune is now a morning object, but it is still too close to the Sun’s glare to be seen before dawn. The eclipse begins when the moon enters the prenumbra of the Earth’s shadow at 5:35am EDT. The partial eclipse begins when the moon enters the umbra of the Earth’s shadow at 6:15am, and totality begins when the moon is completely enveloped within the umbra at 7:54am. The moon, when viewed from Maryland, sets a few minutes later, which is before the moon emerges from the umbra. Venus passes within 3° of the Pleiades. Not many lay observers have actually witnessed a planet’s wanderings among the fixed stars, so watch Venus all month to view its progression between the Pleiades and Hyades. The moon will pass through this area of the night sky on the 20th and 21st of April. This will be a very difficult conjunction to view, because the very young moon and the two planets will lie very close to the Sun at sunset. The view will be spectacular for those lucky enough to have a clear view all the way down to the horizon on this evening. This is not one of the better meteor showers of the year, but meteor enthusiasts will not want to miss it. The best time to observe is from 11pm until dawn. I have been proudly limping along and making do with a five year old laptop since I first tried my hand at astrophotography about two years ago. Photoshop, DeepSkyStacker and Registax really take a while to grind out a finished product on the old piece of schist. I am ready to get serious, I mean really, really serious, about astrophotography. Toward this end, I have elected to purchase Mike Unsold’s Images Plus for processing. I noted that this software is capable of using multiple processors, so I researched various processors and architectures. I settled on a Windows 7 x64 desktop box with an Intel CORE i7-4790K on an ASUS H97M-E motherboard with 16GB memory. It will have a 1TB SATA hard drive, and an EVGA GEFORCE GTX750Ti with 2GB onboard RAM. This should do the job quite nicely. Just to be sure that I can see the finer details of my work, I purchased an Asus 23″ VH238 LCD Monitor. The box should be ready to pick up by Wednesday. Hmmm, instead of dragging a 19″, 5-year old flagstone-ish laptop to the field, perhaps I should upgrade this component of my technology suite soon. There will be a total eclipse of the Sun on August, 21, 2017 beginning in Oregon with the Moon’s shadow racing across a thin swath of the United States and ending in South Carolina. The path of totality will not cross Maryland, so an expedition is required to go see it. I have a telescope, a camera, a Jeep, and a sense of adventure. Why wouldn’t I mount an expedition to see one of the most awe-inspiring astronomical events that humans have ever witnessed? Please check back to this post as I periodically update with specifics as my planning exercise progresses. March 1, 2015: I begin planning with a few parameters in mind: 1) view the eclipse at the point of the longest period of totality, 2) temper that with finding a point where the weather most likely to be clear, and 3) find a jumping off point where I can quickly shift east or west to avoid cloudy skies. Of course, driving to Oregon is out of the question, so perhaps any point from say Missouri to South Carolina might be a reasonable target. March 5, 2015: It is a snowy day in Maryland, which somehow seems an appropriate time to begin working in earnest on an expedition plan for a solar eclipse that will occur on a hot August afternoon almost two and a half years hence. I discovered a great information source: www.eclipse2017.org, and I recommend this Web site for anyone wanting to learn more about this eclipse, or stay current or related developments. Among the things that I learned that makes an expedition an imperative is that my location in Maryland will experience about 85% totality. This will never do! The the ideal place to view the eclipse is at the longest point of totality (2m44s), which will be in Shawnee National Forest in southern Illinois. Coincidentally, the path of totality within a five-hour drive east or west of this point is in a zone that historically experiences 30% to 40% cloud cover in mid-August. This is much better odds than I can ever get in Maryland. The initial plan that I have formulated is arrive in Louisville, KY the afternoon before the eclipse. This is a 9-hour/600 mile drive from Maryland, and Shawnee can be reached in another three hours the next morning. Also from Louisville, there are good routes for moving east or west along the path of totality to reach alternate viewing cites if Shawnee is predicted to be clouded over. March 7, 2015: Looking at east-west options that are reasonably accessible from Louisville, I have selected St Louis, Missouri (4 hours, 250 miles) to the west, and Franklin, Tennessee (5 hours, 380 miles ) to the east the boundaries for selecting alternative viewing sites. I am fairly happy, at least for the moment, to have framed a coincidence of maximum totality, good weather, and accessibility from where I live. Before examining specific viewing sites, I will next work on a viewing plan that can be modified to account for any location that I may elect for viewing the eclipse. February 24, 2016: It has been almost a year since I added planning details, but that doesn’t mean that I have not given a considerable amount of thought to the matter. As I add this entry, it is a cold, blustery, and snowy winter’s day in Saint Louis, just over a two-hour drive to the point of the eclipse’s longest duration, just south of Carbondale, IL. I have formulated Eclipse Logistics Plans A and B. Plan A is a drive straight to Carbondale on the day before the eclipse if Carbondale’s weather is promising. I would either view the eclipse from the Southern Illinois University (SIU) campus where the duration is only four seconds less than the eclipse duration at the longest duration point, or drive the six to eight miles required to get exactly on the eclipse center line. Plan B, if Carbondale’s weather outlook is not so promising is to drive to Louisville, KY the day before the eclipse and bed down there. This would require that I wake up at zero-dark-thirty the next morning, assess the best weather prospects either east or west of Carbondale, and drive there leaving sufficient time to set up before the eclipse begins. In the next installment, I will capture my thinking on what equipment to take and how to observe and/or photograph the event.